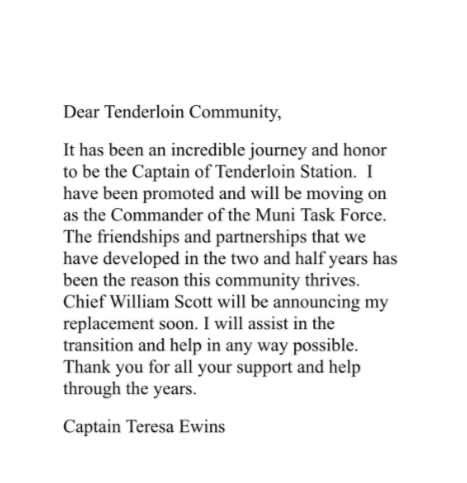 As many have now heard, Tenderloin Station Captain Teresa Ewins has been promoted to Commander of the Muni Task Force. Ewins has served as Tenderloin Station captain for more than two years. The message was circulated via Twitter, with the announcement of a replacement coming soon from SFPD Chief William Scott. The Tenderloin Community Benefit District would like to express our appreciation for Ewins' commitment and partnership over the last several years. Thank you for your service to the community.